The property, which consists of a house with private pool and additional two apartments with separate entrance, is situated in a quiet and peaceful 1100 m² estate, in the nice neighbourhood of the village Maslinica, surrounded with Mediterranean vegetation, secluded from noise and intrusions.The house is newly built, surrounded by a large garden with Mediterranean trees and plants. Here you can really find the true Mediterranean. Listen to the sea, crickets and birds whisper to you while relaxing in the shade of pine trees. Enjoy the healing smells of Mediterranean vegetation as you dive into the serenity of the deep blue of the Adriatic Sea. Find your peace in our villa, enjoying the sunsets of Maslinica, a small village located on the west coast of this magnificent island. Accessibility: The Island of Šolta is easily reachable from Split. Ferries go from Split 6 times a day and the ride lasts only 45 minutes. For guests that are coming without a car there are speed boats going 2 times a day and they reach Šolta in 20 minutes. For those guests we can also offer transportation to the apartment. Split is the biggest city in the region, situated on major tourists routes. Main Croatian motorway runs to Split and in 3 to 4 hours of driving you will reach Split from western borders of Croatia. Buses, trains and ferries come to Split from all around Europe. Accessibility by air: Airport Resnik is the only airport of the City of Split and the biggest in the region. From the airport to Split seaport, where you take the ferry or speed boat, it’s a 25-minute drive. There you take a boat to Šolta. Also, we can arrange transportation from airport to the ferry. With the ride from the airport, a ride with a boat and a short ride on the island you could easily be at your vacation place within 2 hours of travel. My name is Jean. I'm 48, living in Split with my wife and three children. My wife and I take pride in our property and we are committed to make your stay at our villa comfortable and enjoyable. Šolta still escapes mass tourism and commercialization. You can really enjoy swimming, sports activities, diving and snorkeling and of course touring the island by foot, bike, car or bus. This island is such a peaceful romantic place with easy access to the historical Unesco sites of Split, Trogir and Hvar. Compare to the other areas of the island this, west side, has cleaner waters, better views and picturesque little village that has grown from around an old castle. Large private pool (8.7 x 3.7 x 1.7 m) with natural water purification system (electrolysis with sea salt). A beautiful large garden. Crickets and birds whisper all around. Healing smells of Mediterranean vegetation. Shade of pine trees. Sea views to the west. Sunsets... Natural beaches with crystal sea 10 minutes walk away . Restaurants 10 minutes walk away. Center of village 10 minutes walk away. Vicinity of the City of Split. Quiet neighborhood. This house really has all the amenities of home. Crickets and birds whisper, the smells of Mediterranean vegetation heal your body and soul. Sea views to the west. Bathrooms are totaly new. It is kept clean and provides everything our guests need. The pool is built in winter 2016. Layout dimensions are 8,7 x 3,7 x 1.7 meters. The entire one side of the pool are stairs as chill out zone. It works on the principle of electrolysis with sea salt. The villa and pool is in a fab location where there is no need for a car - I wouldn’t bother hiring one next time. There are perfectly adequate bus services to and from the ferry - Rogac - Split. The restaurants and beaches of Masalinica are very sweet and the people are gentle and welcoming. Jean was a perfect host and was extremely accommodating. The house is just lovely - I would agree with a previous guest however that air conditioning in the bedrooms would be a bonus - but I am also aware of how expensive the units are to run. The pool is fab and was very welcome during the heat of the day. We would love to return - we have such a wonderfully relaxing week. Lovely property, great pool, amazing views and helpful hosts. We had a great time staying at this property for 10 nights. The house was very clean on arrival. The house has a lot of character and the pool and outside space are fabulous for adults and kids alike with wonderful views out the sea and the neighbouring islands. The hosts were very helpful and easy to contact throughout the stay. Maslinca is a lovely village with some good restaurants (although you need to book in advance). I would recommend having a car for ease of seeing more of the island and also the supermarket option in Maslinca is fairly limited. There are more shopping options in Grohote (Butcher, Baker, fish stall, fruit and veg stalls & pharmacy) 10 minutes away, but we found the taxis to be an expensive option. The beach is absolutely gorgeous - swimming and snorkelling was a highlight of our trip. We had a great speedboat transfer which Jean helpfully arranged for us and transferred us and our luggage the little way from the marina. Only reason we haven’t given 5 stars is that the bedrooms weren’t air conditioned (there is one AC unit in the stairway). Other than that fabulous stay and we would definitely recommend. We had a great stay at the apartment. Everything was clean and comfortable. We enjoyed our stay! We would come back anytime! We stayed in this really nice house in the end of July 2018, and felt welcome form the beginning. The owner picked us up by the ferry. Sean and Sanja are perfect hosts and they really care for their guests. They provide the best of service and the house is very well kept. The house is even better than the pictures and we had a lovely relaxing week. Sheets and towels are fresh and the whole property is very clean. Maslinica is a small town. There is one grocery shop whithin walking distance and a few restaurants in town. But we found the best food in the Konoba Sesula, also whithin walking distance. If you want a relaxing week in a really nice house with all the amenities you need and the best hosts you shuold rent this house. We would gladly give our warmest recommendations to our friends and family. We were two families with 4 adults and 5 children and we had ten woundful days at Solta. The house was delicate and clean. Both the house and the pool were according to the pictures. Please be aware that the nineth bed is a sofa bed in the living room. I drove around the Solta island for a day and I would not change this villa for any other property on the island. The owners Jean and Sanja were very friendly, helpful and hospitable. Lovely villa with beautiful views in a quiet area and wonderful owners. This will possibly post as Chris May as he booked the villa but I am his daughter Nicole Burgess who joined my parents with my husband and our two daughters aged 1 and 12. I cannot recommend this place enough, the villa is lovely, clean and has everything you need with an upstairs bathroom and downside toilet with shower which was great for us as meant we didn't have to go upstairs for the loo in the evening so didn't disturb the baby. The pool is lovely, although a little chilly on occasion, and the views are superb. Jean and his wife were absolutely wonderful with nothing too much trouble. They even bought a cot and high chair especially to accommodate for the baby which we are very grateful for. We would definitely recommend this villa and would definitely return. Thank you Jean for everything and we hope to see you again. Beautiful natural beaches with crystal clear water that overlook some of the famous Croatian islands are in your daily routine when you stay in our house. Maslinica village is placed on the western shore of the island Šolta. Compare to the other areas of the island this part has cleaner waters, better views and picturesque little village that has grown from around an old castle. This island still escapes mass tourism and commercialization and is still not a well known tourist resort. 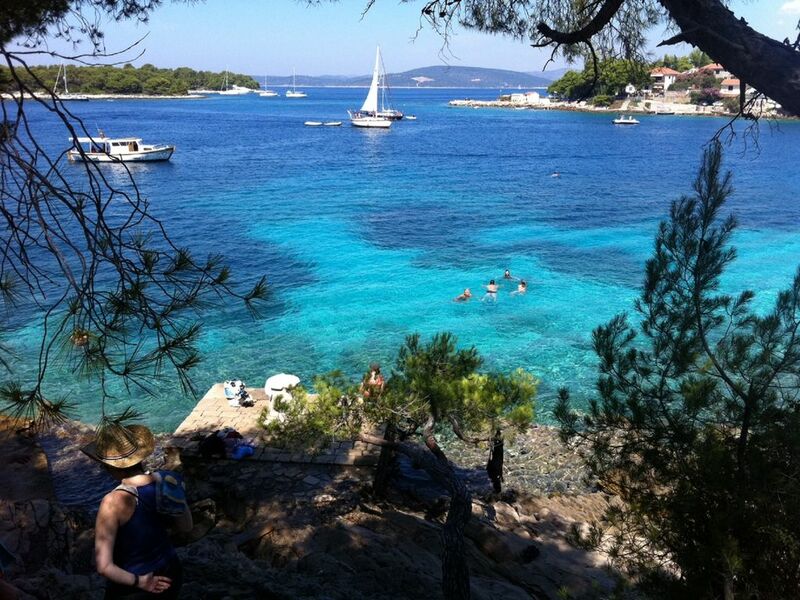 But as it is now very well connected with the main land it offers a true experience of the Croatian island. Also there are some very fine restaurants in the village. In the village there is also a marina, visited by yachts and boats as a must go through place for those sailing in Croatia.
. Prices are approximate and the exact prices are available at request. Price changes with number of people, number of days and time of the season. To confirm reservation it is necessary to pay 30% in advance. . Arrival to apartments is after 14.00 and departure till 10.00. Welcome!